Giant’s Castle Game Reserve is located on a mountain peak in the southern Drakensberg in KwaZulu-Natal. This part of the Drakensberg was named Giant’s Castle because the profiles of the peaks resemble a silhouette of a sleeping giant. Giant’s Castle has a panoramic landscape from the picturesque mountain cliffs, which have a golden glow at sunset. These cliffs are home to Cape vultures, bearded vultures and many birds of prey. Below the cliffs are luscious green plateaus, where black-backed jackals and mountain baboons can be found. Sparkling springs course down to the mountain creating scenic fields of flowers. There are a number of adventurous activities that guests can enjoy such as horse trails, micro-light and helicopter flights, and hiking trails. 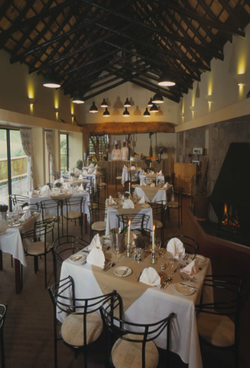 Guests can also visit Bushman Rock Art and enjoy live performances from the Drakensberg Boys Choir. ​The Giant’s Castle Main Camp comprises of 3-star self-catering chalets some with fantastic views over the mountain, some with quaint garden views. There are 37 of these chalets, all of which have en-suite bathrooms, fully equipped kitchens and spacious lounges. There is a restaurant on site for those who do not wish to cook. There are many walks from the camp, including the half-hour gentle walk to the main cave and Bushmen museum where guests can appreciate the ancient art of the San people. A guided interpretation of the San Art is available on an hourly bases from 09h00 until 15h00. Close to the camp is a vulture hide, which is famous for white backed vulture sightings in the winter months. Children of all ages are welcome at Giant's Castle Main Camp.